Wonderful 16th century farmhouse on the Careggi Hills. The building has been expanded over the centuries, creating a modulated but harmonious structure. The 450 square meter house is spread out over several levels with a large loggia with columns as well as a garage. On the ground floor we find a spacious foyer with the living area composed of a large living room and a small bar area; a quaint living room with a fireplace and a corner over. A dining room, service bathroom, ironing room with attached bathroom, two storage rooms, and a small office. The staircase in the entrance hall will take you to the first floor where we find the master bedroom with a walk-in closet, bathroom, and access to the solarium area; another large bedroom with a bathroom and two walk-in closets; two smaller rooms with shared bathrooms and walk-in closets; and a guest room which leads to a second floor where there is a large room in attic. 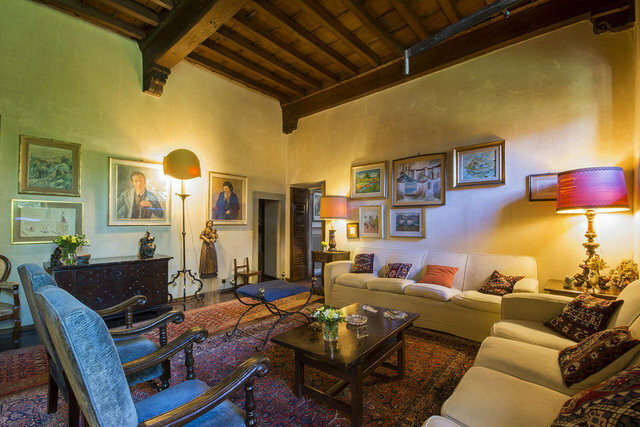 The property is surrounded by 1.7 hectares of farmland, including 120 olive trees, a large park with ancient trees, a lemonhouse and cellars (110 square meters), a swimming pool, and two working wells. A small stream runs through the property.